Earlier in this series I looked at the ordilabel() and then the orditorp() functions, and most recently the ordipointlabel() function in the vegan package as means to improve labelling in ordination plots. In this, the fourth and final post in the series I take a look at orditkplot(). If you've created ordination diagrams before or been following the previous posts in the irregular series, you'll have an appreciation for the problems of drawing plots that look, well, good! Without hand editing the diagrams, there is little that even ordipointlable() can do for you if you want a plot created automagically. orditkplot() sits between the automated methods for decluttering ordination plots I've looked at previously and hand-editing in dedicated drawing software like Inkscape or Illustrator, and allows some level of tweaking the locations of labelled points within R.
Assuming your R can use Tcl/Tk, we'll begin. Note that when calling orditkplot(), you can specify a number of extra arguments that control how the configuration will be drawn on the Tk canvas, as well as pass in some graphical parameters from ?par; read ?orditkplot for details of which parameters are currently supported. Not all will affect the look of the rendered plot on the canvas but they do allow another level of control. You can now move labels around on the plot and edit labels. These features are illustrated in the video below, in which I spend a few minutes editing the base plot so that there is no overlap in the labels. To move a label around, lift-click on the label and drag it to a new location. You'll notice that the label is highlighted with a yellow background, and that as you move the label around, it is tethered to its score point by a thin line. This last feature allows you to move labels temporarily well out of the way whilst editing and not have to remember which labels belong to which points! A double left-click will bring up a small dialogue box containing the current label text, which can be edited. Hit Enter once you are happy with a label to close the dialogue and have the change reflected in the plot. You can use the right mouse button (or Shift + left mouse button) to drag an area to zoom to. This opens another Tk canvas which is itself a separate plot showing only the region of interest; this is an experimental feature and not all arguments are passed to the new canvas. Note that as this is a separate canvas, this feature cannot be used to temporarily zoom in to a region of the current plot to facilitate editing. The Copy to EPS button uses Tcl/Tk functions to render the plot on the canvas to an EPS file. How well this works out will depend on the capabilities of your OS and the Tcl/Tk version in use. A save dialogue box will open allowing to specify a filename for the plot and where the file will be created. 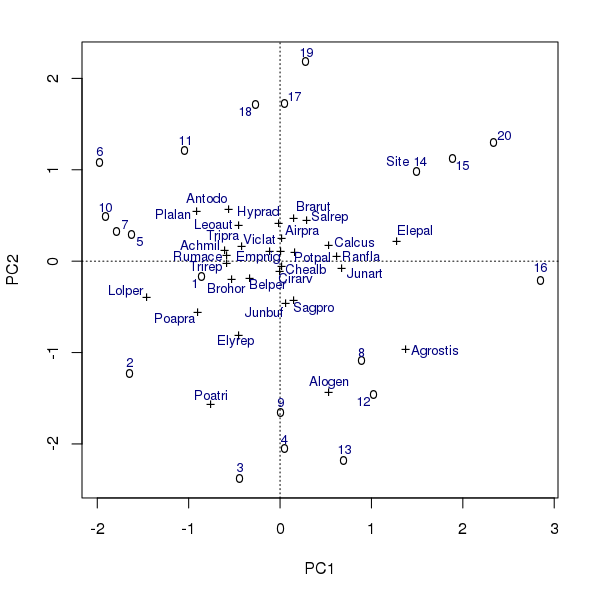 Export plot takes the R representation of the current Tcl/Tk plot and plots it to one of the following devices using plot.orditkplot(); EPS, PDF, PNG, JPEG, BMP, TIFF. In addition, the plot can be exported in Xfig format via the same dialogue box. Choose the filetype wanted from the drop-down box, specify a filename and location for the saved file. labels and points; numeric matrices of coordinates for the centres of the labels and points respectively. If you included site and species scores in the base plot, as I did above, then these matrices contain a mixture of both scores. There is no way to directly index the species or the site scores from each matrix. par contains relevant graphical parameters. See ?par for their meaning. args contains vectors of other graphical parameters which control how the scores in labels and points are drawn. tcol and tcex control the colour and size of the labels for example, whilst pcol and pcex do the same for the points. This is how the distinction between species and site score points is preserved; they have different parameters controlling how they look. There are a number of other components in this list, including the axis limits. dim contains the dimensions of the plot region, the box containing the points and labels. All of these are sufficient to give a reasonably faithful representation of the plot as it looked on the Tcl/Tk canvas but on a R plot device. This object can be plotted via the plot() method plot.orditkplot(), and added to as if it were any other R plot. Dismiss closes the canvas window. 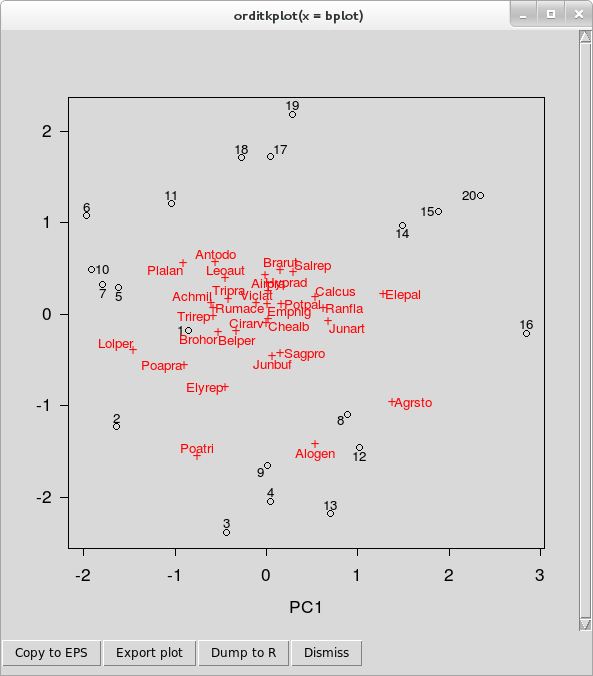 Plot produced by using points() and text() methods for class orditkplot. The points() method is inconsistent with the plot() method and uses the same plotting character for all points1. There is also a scores() method if you need to extract the locations of the labels or the points in the coordinate space of the plot. And with that, we've come to end of the brief tour of the tools that vegan provides to help produce ordination plots. If these don't meet your needs, then you can export the plot as an EPS, PDF, or another vector format that can be edited in a vector drawing package like Inkscape. vegan provides lots of other functions to enhance ordination plots, and I'll take a look at some of those next year. Use the comments to let me know if of any particular functions you'd like me to cover first.